There is a new theatre space in town. Members of the local theatre community and investor’s group spearheaded by Vittorio Oliverio have been working hard to open the Blank Space theatre for the Nov. 1 opening gala. “Blank Space, (located at Unit 3 1416 2 Ave S) is exactly what it sounds like— it’s a blank space available to local theatre groups, arts groups and artists who need a place to rehearse and perform in,” said Blank Space board member Karolyn Harker, who is organizing the gala. There will be a 50 50 draw and a silent auction and live entertainment. Theatre Outré opens their season with Sapientia, Oct. 30-Nov. 3 at Club Didi. “It’s perfect for Halloween,” said producer Jay Whitehead who performs in the play, written in the tenth century by Roswitha of Gandersheim. Director Mia Van Leeuwen uses object theatre to tell the story of a woman who goes to Rome, preaching Christianity with her three daughters. “The Emperor Hadrian tells her to stop, but she doesn’t so they torture and kill her daughters,” said Van Leeuwen, noting she has done the show in Edmonton in 2014, Winnipeg in 2015 and in Montreal this past summer. She noted the objects she used in the performances have changed over the course of the performances. “If you were to do this in a film or in stage form, it would be something like Game of Thrones,” said Theatre Outré producer Jay Whitehead, who plays Hadrian. 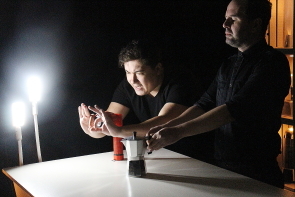 So while actors Whitehead, Jordan Payne, Kathy Zaborsky and Erica Barr perform the lines, a mirror, espresso maker, flashlight and tea cups are the actual characters. “ It‘s like puppetry, except we make no secret of the fact that the actors are manipulating the puppets,” Whitehead said. “It’s very dark, but we’ve also found a lot of humour in it,” he continued. “ But because we’re using objects, it makes the subject matter a little more palatable,” Whitehead said. “ But it’s still very disturbing,” he added. “It deals with religious extremism, ” said Van Leeuwen, noting the subject matter has become even more relevant today. “I can’t imagine martyring a daughter or dying for a cause,” she said, adding she brought the play to fellow U of L drama prof Whitehead for consideration for Theatre Outré because she like the theme, the idea of doing it as object theatre and letting people know about the playwright who is the first known female playwright. If you’ll pardon the easy pun, putting on the musical version of the Peter Stone penned / Maury Yeston composed Tony Award Winning musical of the Titanic, is a “Titanic” undertaking. The LSCO fundraising presentation happens at the newly renovated Yates Centre, Oct. 18-20. Including crew, there are over 120 people involved in the production from all walks of life and of varying theatrical experience from people who are brand new to the stage to people to whom the stage is like a second home. 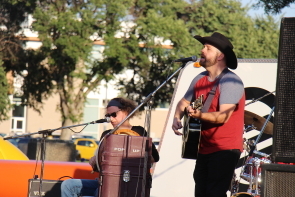 There are familiar faces from Hatrix, Shakespeare in the Park, Playgoers of Lethbridge LMT and the U of L and even New West Theatre veterans, plus people who have never on stage before and people who haven’t been on stage for a while. 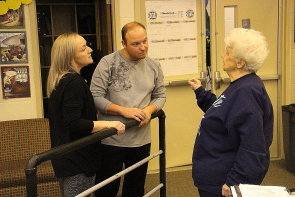 “Ken Rogers and I won’t put on any musical that isn’t outside the box,” said director Fran Rude who is directing a cast of 39 plus working with Rogers to organize an orchestra of 21 and a chorus of 42. “Go big or go home,” she said. Instead it is based on the book “ A Night to Remember,” by Walter Lord and Robert Ballard, who discovered the wreck. “That‘s important because it is based on interviews with the survivors and their descendants,” Rude said. She is excited to welcome James Robinson back to the stage as E.J Captain Smith. “As soon as I decided to do this, I had James in mind for the captain. We haven’t been on the stage together for 30 years when we were in South Pacific together,” she said. “I wanted to be involved because wanted to work with Fran,” said Robinson. Playgoers of Lethbridge is excited to bring the farce “ Til Beth Do us Part to Country Kitchen, Oct. 23-27. 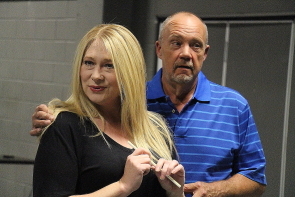 While they have done several plays penned by Jessie Jones, Nicholas Hope and Jamie Wooten, who among other things , have written for the Golden Girls, for this production Playgoers welcomes aboard new director Lori Garner, who has a long history working with the Raymond Playhouse. “The first show I did with Raymond was Anne of Green Gables about 35 years ago and I played Anne, so that shows how far I go back,” Garner chuckled, adding she is excited to work with Playgoers of Lethbridge for the first time. “I always wanted to work with Playgoers, so I offered my services as a director to the board so myself, Linda Johnson and Rita Peterson read some scripts. I’ve seen many of their shows, so I knew what to expect. I know they like to do something lighter for their dinner theatres,” she said. ’Til Beth Does Us Part is the tale of career-driven Suzannah Hayden who needs a lot more help on the home front than she's getting from her husband, Gibby. “Lately, nurturing his marriage of 27 years hasn't been the highest priority for Gibby, but pretty soon he'll wish it had been. Enter Beth Bailey, Suzannah's newly-hired assistant, a gregarious, highly-motivated daughter of the South. To Suzannah's delight, Beth explodes into the Hayden household and whips it into an organized, well-run machine. This couldn't have happened at a better time for Suzannah, since her boss, Celia Carmichael, the C.E.O. of Carmichael's Chocolates, is flying in soon for an important make-or-break business dinner. Gibby grows increasingly wary as Beth insinuates herself into more and more aspects of their lives. In no time, she exceeds her duties as a household assistant and interjects herself into Suzannah's career. As Suzannah's dependence on Beth grows and Gibby's dislike of the woman deepens, Suzannah gives Beth carte blanche to change anything in the household that ‘will make it run more efficiently.’ And the change Beth makes is convincing Suzannah that Gibby must go. When he realizes it's Suzannah's career Beth is really after, a newly-determined Gibby sets out to save his marriage aided by Suzannah's best friend, Margo, a wisecracking and self-deprecating divorcee and her ex-husband, Hank, who is in the midst of his own mid-life crisis. Their effort to stop Beth at any cost sets up the wildly funny climax in which things go uproariously awry just as Suzannah's boss arrives for that all-important dinner,” according to the official synopsis. “He needs to help out more around the house. So basically Suzannah hires Beth to help out and she helps Gibby right out of the house,” Garner chuckled. “ It’s only after he’s living in a broken down apartment with his best friend, that he realizes how important it is for him to work on his marriage and help his wife,” she continued. “It’s been a blast. The cast are a lot of fun and it’s always exciting to work with new people,” she said. “ It’s a little scary not having an actual theatre and only being able to get in two days before. In Raymond, we have a theatre and we can build the sets in advance. But we’ve got cast here who have done this before,” she said. The cast includes some familiar faces who have performed with Playgoers of Lethbridge and Hatrix Theatre including Marci Stork playing Celia Carmichael, owner of Carmichael’s chocolates and Suzannah’s boss, Shelly David playing Beth, Kirk Boehmer as Hank and Jocelyn Steinborn as Suzannah. It also includes new faces including Jack Ford as weatherman Gibby and Christina Peterson as Celia. John Ford is excited to make his Playgoers of Lethbridge debut as Gibby, who wasn’t expecting to get the lead role.